198 Trade and Technical Training Certificate Programs 2018-2019 Learn the basics of pipe welding, including techniques for shielded metal arc welding and gas tungsten arc welding processes. Develop skills to industry standards and American Petroleum Institute-1104 Code along with the American Society of Mechanical Engineers Boiler Pressure Vessel Code. 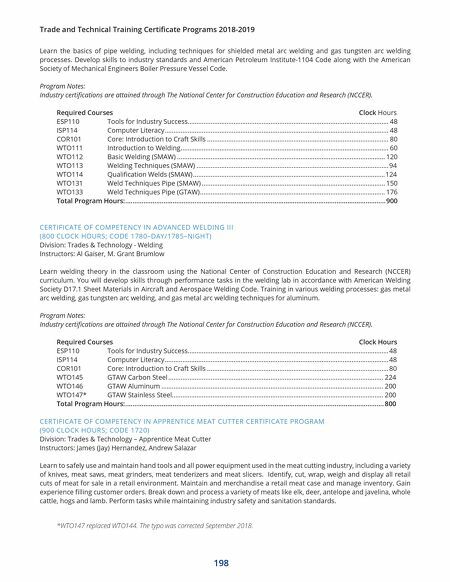 Program Notes: Industry certifications are attained through The National Center for Construction Education and Research (NCCER). Required Courses Clock Hours ESP110 Tools for Industry Success .................................................................................................................. 48 ISP114 Computer Literacy ............................................................................................................................... 48 COR101 Core: Introduction to Craft Skills ....................................................................................................... 80 WTO111 Introduction to Welding ...................................................................................................................... 60 WTO112 Basic Welding (SMAW) ...................................................................................................................... 120 WTO113 Welding Techniques (SMAW) ............................................................................................................. 94 WTO114 Qualification Welds (SMAW) .............................................................................................................124 WTO131 Weld Techniques Pipe (SMAW) ........................................................................................................ 150 WTO133 Weld Techniques Pipe (GTAW) ......................................................................................................... 176 Total Program Hours: ............................................................................................................................................... 900 CERTIFICATE OF COMPETENCY IN ADVANCED WELDING III (800 CLOCK HOURS; CODE 1780–DAY/1785–NIGHT) Division: Trades & Technology - Welding Instructors: Al Gaiser, M. Grant Brumlow Learn welding theory in the classroom using the National Center of Construction Education and Research (NCCER) curriculum. You will develop skills through performance tasks in the welding lab in accordance with American Welding Society D17.1 Sheet Materials in Aircraft and Aerospace Welding Code. Training in various welding processes: gas metal arc welding, gas tungsten arc welding, and gas metal arc welding techniques for aluminum. 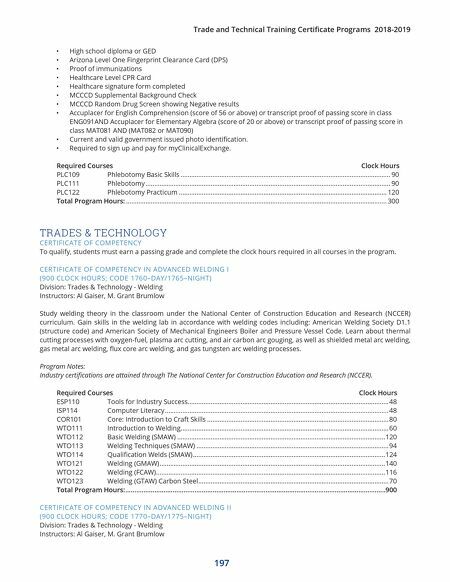 Program Notes: Industry certifications are attained through The National Center for Construction Education and Research (NCCER). Required Courses Clock Hours ESP110 Tools for Industry Success .................................................................................................................. 48 ISP114 Computer Literacy ............................................................................................................................... 48 COR101 Core: Introduction to Craft Skills ....................................................................................................... 80 WTO145 GTAW Carbon Steel .......................................................................................................................... 224 WTO146 GTAW Aluminum .............................................................................................................................. 200 WTO144 GTAW Stainless Steel ........................................................................................................................ 200 Total Program Hours: .............................................................................................................................................. 800 CERTIFICATE OF COMPETENCY IN APPRENTICE MEAT CUTTER CERTIFICATE PROGRAM (900 CLOCK HOURS; CODE 1720) Division: Trades & Technology – Apprentice Meat Cutter Instructors: James (Jay) Hernandez, Andrew Salazar Learn to safely use and maintain hand tools and all power equipment used in the meat cutting industry, including a variety of knives, meat saws, meat grinders, meat tenderizers and meat slicers. Identify, cut, wrap, weigh and display all retail cuts of meat for sale in a retail environment. Maintain and merchandise a retail meat case and manage inventory. Gain experience filling customer orders. Break down and process a variety of meats like elk, deer, antelope and javelina, whole cattle, hogs and lamb. Perform tasks while maintaining industry safety and sanitation standards.